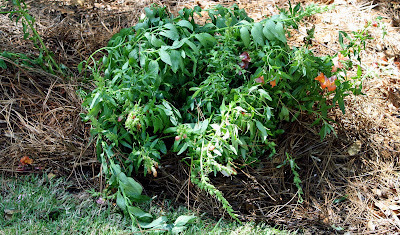 Southern Lagniappe: From 2011: "An Earthworm Story"
After each battering by rain and wind, they became more and more bedraggled, and finally got to the point that they couldn't straighten back up. Poor things ... yesterday, I took them out of their misery and pulled them up and transplanted them in one big clump in the backyard. Before I pulled them up, though, I cut some blooms and stuck them in a glass and put them on a table under our porch. 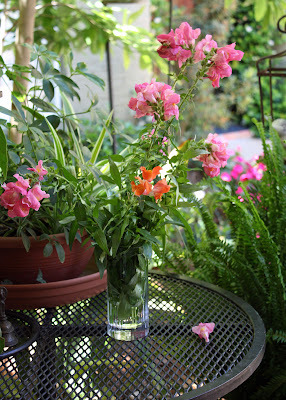 My "stick-in-a-glass-or-jar" bouquets usually turn out better than the ones I try to arrange, and I'm sure we'll enjoy these pretty Snaps all weekend. 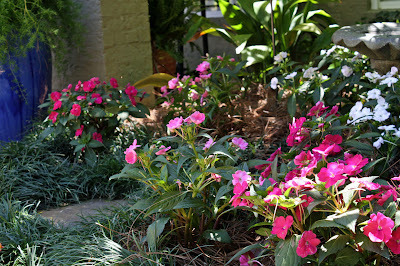 I replaced the Snapdragons with a few Sunpatiens, and love the color they added to the courtyard. While digging the holes to plant the flowers, I disturbed quite a few earthworms, and stopped to watch as they wiggled and burrowed their way back under the dirt. 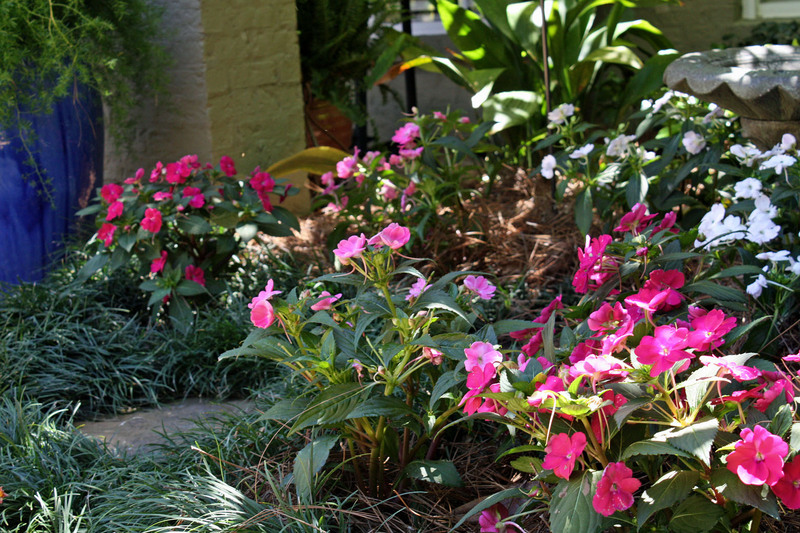 As I watched them, I couldn't help but wonder if my probings with my trowel hurt them, or if the bright sunlight hurt their eyes ... or if they even have eyes! 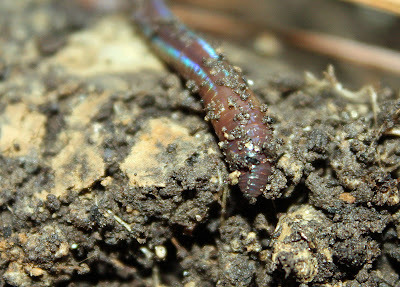 The more I thought about them, the more curious I became, and after doing a quick Google search, I came across the University of Illinois Extension's website, which provided some interesting facts about earthworms (comments in bold are mine). A worm has no arms, legs or eyes. An earthworm can grow only so long. A well-fed adult will depend on what kind of worm it is, how many segments it has, how old it is and how well fed it is. 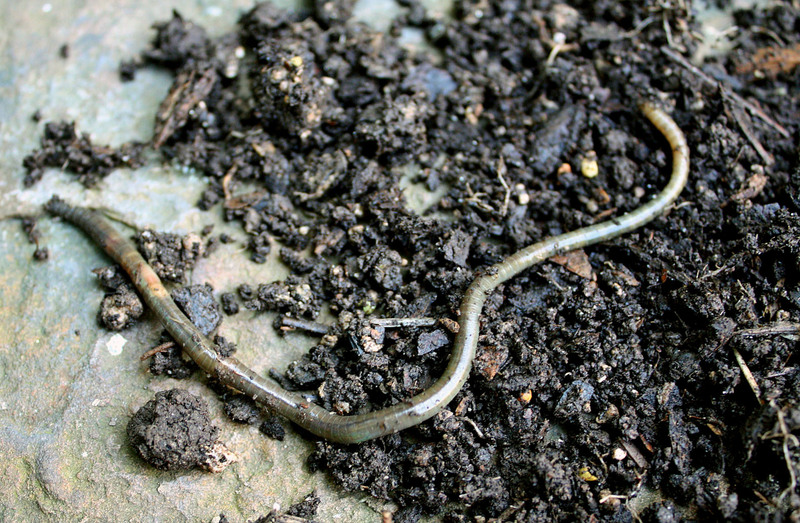 There are approximately 2,700 different kinds of earthworms. Worms live where there is food, moisture, oxygen and a favorable temperature. If they don’t have these things, they go somewhere else. 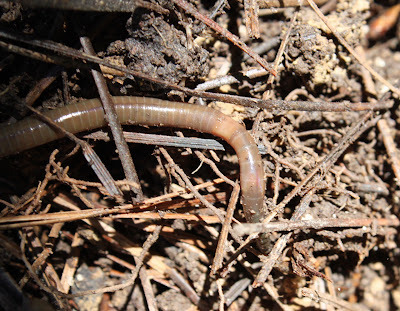 In one acre of land, there can be more than a million earthworms. Worms tunnel deeply in the soil and bring subsoil closer to the surface, mixing it with the topsoil. Slime, a secretion of earthworms, contains nitrogen. Nitrogen is an important nutrient for plants, and the sticky slime helps to hold clusters of soil particles together in formations called aggregates. Charles Darwin spent 39 years studying earthworms more than 100 years ago. Baby worms are not born — they hatch from cocoons smaller than a grain of rice. Even though worms don’t have eyes, they can sense light, especially at their anterior (front end). They move away from light and will become paralyzed if exposed to light for too long (approximately one hour). 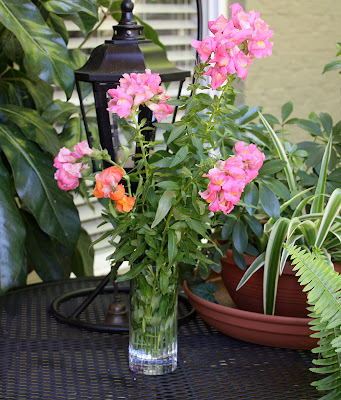 If a worm’s skin dries out, it will die. Worms can eat their weight each day. I learned a lot about earthworms as a result of my research, and I also discovered that there's no way you can capture a pretty picture of a worm (or at least, I couldn't). But that didn't keep me from trying. One little worm was especially gregarious, and stopped wiggling and burrowing long enough for me to get a few closeup shots. I told you it wasn't pretty! Unfortunately, in most of the pictures, he looked more like a little snake than an earthworm (shudder, again! 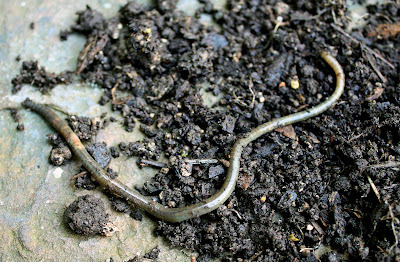 ), and he was slimy and covered with dirt (well, after all, he was an EARTHWORM, right?). To make matters worse, I couldn't tell which end was his head and which was his tail, but figured he would be burrowing with his head, so I focused on the "burrowing end." And in this one, you can see his segmented body which contracts to help him burrow under the dirt. Poor little thing ... he's probably burrowed his way halfway to China by now to escape my trowel and zoom lens. 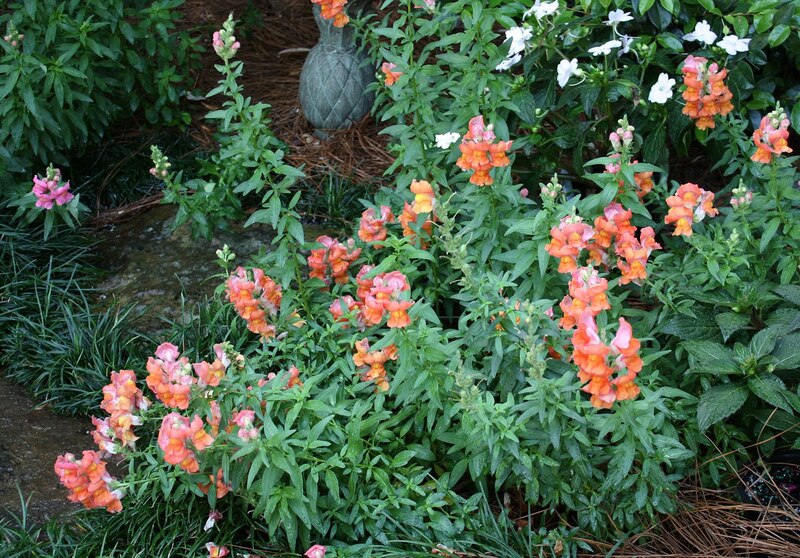 But I'm glad I had the opportunity to satisfy my curiosity about earthworms, and I like knowing that they are busy at work in my flowerbeds burrowing and loosening the dirt so my flowers can flourish. 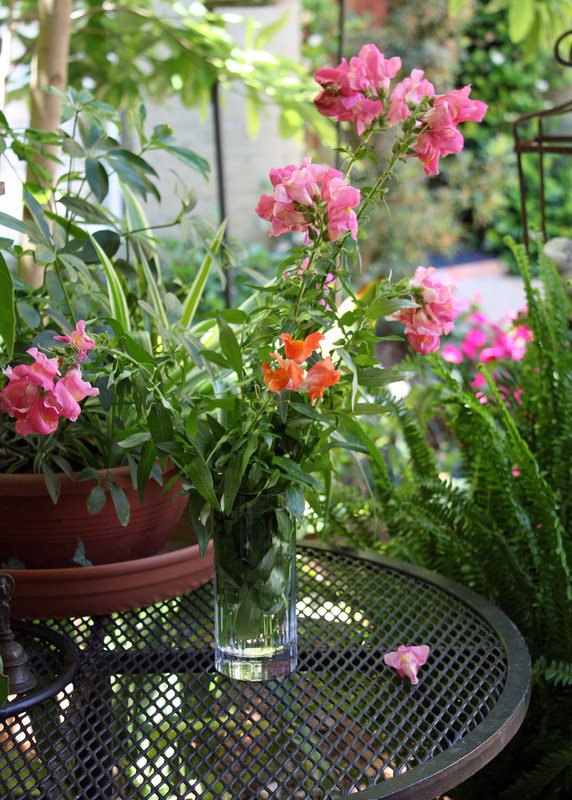 And to leave you with a pretty picture for the weekend, here's another one of my "bouquet."